In computer networks and distributed industrial control systems, serial communication is often used to realize data exchange. The RS-232 is one of the earliest port standards of serial communication. It is widely adopted in short distance (<15M) and lo- baud-rate serial communication. The RS232 is mostly used for the communication among computers and devices, data monitoring, and device adjustments. In the process of its application, communication cables can be coupled to an external interference easily which will cause certain impacts on signal transmission. At the same time, the interference from the circuit may also produce external radiation through cables. Based on EMC principle, it is designed with hierarchical disturbance suppression and anti-sensitivity functions. L1, L2, C1 and C2 are filter capacitors; while L1 and L2 are magnetic beads, which are recommended to be set at the values of 600 Ω / 100 Hz. All are used together in the suppression of high frequency interference from the circuit. The capacitors C1 and C2 function to filter the interference on the cables with the value of 330pF; R1and R2 are current-limiting resisters with the value of 100 Ω, which can be adjusted according to testing conditions. C3 is the jumper capacitance between the interface and the digital place. Its typical value is 1000pF and its minimum pressure resistance is 2kV. The capacitance of C3 can be adjusted according to the test situation. D1 and D2 are electrostatic protection ESD’s. We can select two pieces of single-route leiditech SD12C or one piece of SMC12 or SMC15 with SOT-23 sealing to complete the circuit protection. They can prevent the IC from getting damaged because of the amount of interference energy and electrostatic interference that is produced during hot plug. 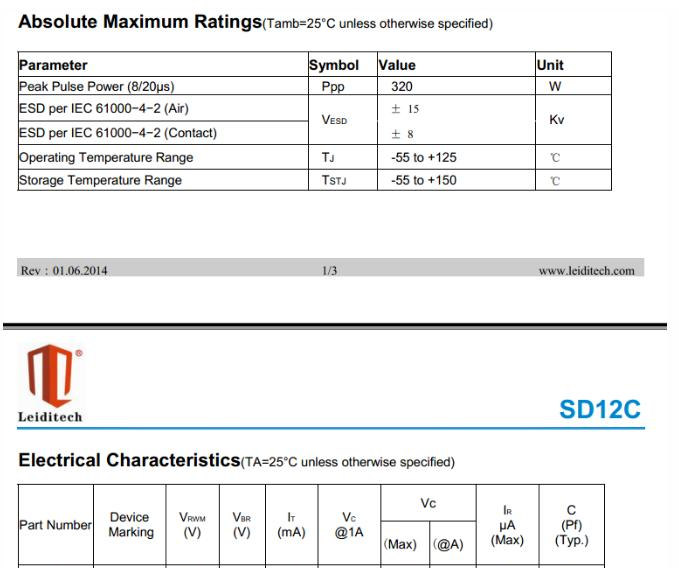 When selecting protective components, make sure that the starting voltage of the components is greater than or equal to 12V*1.2= 14.4V. If the shell of the device is made of metal and the interface ground can be separated from the single-board independently, the metal shell should be connected to the interface ground directly, maintaining the1000pF’s capacitance between the single board ground and interface ground. ( 1 ) Thanks to sophisticated milling technology in the panel cutting process, the shape of the hole is more apt to be placed with a connector to avoid any cracks caused by inaccurate milling. The lesser the cracks, the lesser the electromagnetic interference will be. After conducting tests and experiments, it is discovered that we can raise the electromagnetic capacity up 13%-18% by precise milling and penetrating technology. 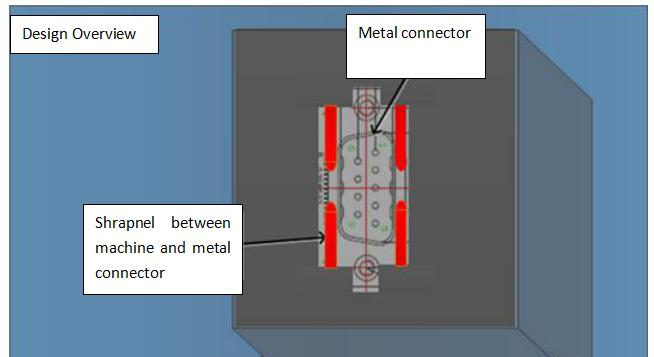 ( 2 ) In order to maintain satisfactory electrical conductivity, we need to add a shrapnel in the connection part between the machine and the metal connector. The connection method is illustrated in the above picture. ( 1 ) The shielding of the RS232 signal cable is composed of a mesh braiding layer, whose density should be over 90%. ( 2 ) As shown in above picture, the signal transmission cables are arranged in parallel with the ground cables. ( 3 ) Magnetic rings shall be added to both ends of the cable. The inner diameter of the magnetic ring should be closely placed with the outer diameter of the cable, choosing as thick and long of a magnetic ring as possible. ( 1 ) The alignment design should be far away from other strong interfering sources such as power supply units. ( 2 ) It’s preferable to align the cable individually, or to keep a distance over 10cm away from other stimulated powered cables. It’s forbidden to mix it with other cables and bind them altogether. 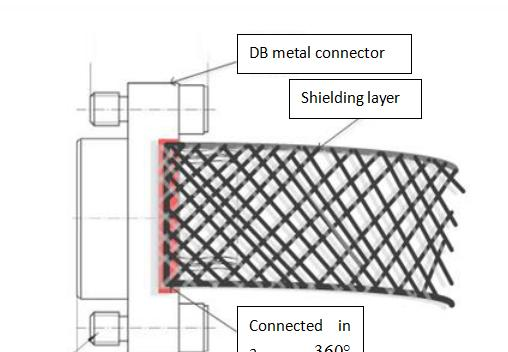 ( 1 ) Bridge the metal connector with the shielding layer of the shielding cable in a 360° manner, as shown in above picture. ( 2 ) Avoid any “tailing” that occurs when shielding the shielding layer of the cables.